Continuing with the posts about JCA lets now have a look on the specifics of an Inbound JCA connector. As already mentioned in a previous post the term inbound is related to the flow of the call on your application. The endpointActivation method plays a key role in an Inbound adapter. This is the method that is triggered by the container on each of the Activation Specs you have configured on your Application Server instance. This is also the point where you start your monitoring thread (FooMonitor in our example). 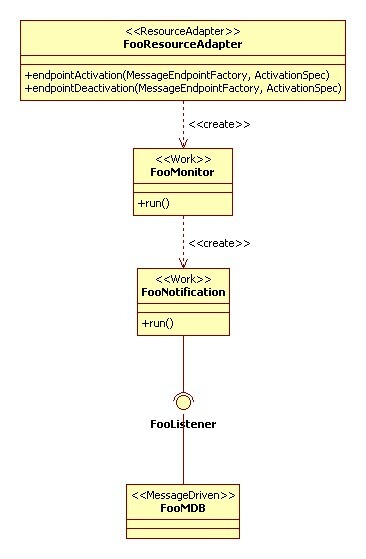 Remember that this monitoring object has to have access to a number of key container classes such as MessageEndpointFactory implementation and also WorkManager. Apart from container objects you’ll certainly need to have the ActivationSpec object passed on the endpointActivation method since it carries on the configuration provided for this activation spec (taking JMS as an example it’d be host, queue, username, …). Another point to remember is that you’ll need to have a reference to the monitor threads that were activated since on container shutdown it’ll invoke the endpointDeactivation method and you’ll need to retrieve the related monitor thread and stop its execution. As you may have already guessed, FooMonitor is the thread that will poll for events and schedule their notifications through the WorkManager. You should never use the monitor thread for the notification since it’ll be blocked during notification denying the sending of other notifications. That’s the reason you should schedule an asynchronous notification using WorkManager. As already mentioned, that’s the point where the MessageEndpointFactory is used. It provides us proxies for FooMDB classes. Remember to ALWAYS invoke release after using this proxy otherwise your container may run out of proxies since it’ll think you are still using them. Another aspect not really detailed is the msg parameter on the onMessage method: this one is dependent on your ResourceAdapter – You are the one responsible for defining it (unless you have chosen a regular API like JMS).